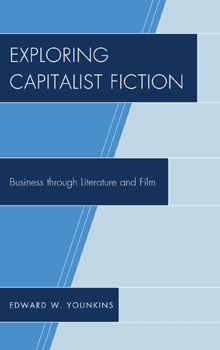 Exploring Capitalist Fiction, a new volume of literary analysis by Dr. Edward W. Younkins, offers perceptive, relevant, and engaging commentaries on 25 works of fiction which portray the business world and its relationship to all areas of human life. The novels, plays, and films featured in the book span 125 years of literary culture – from The Rise of Silas Lapham (1885) by William Dean Howells to the 2010 Oliver Stone film Wall Street: Money Never Sleeps. This volume offers thorough coverage of both works that portray heroic entrepreneurs and economic liberty in a positive light – such as Ayn Rand's Atlas Shrugged, Garet Garrett's The Driver, and Henry Hazlitt's Time Will Run Back – as well as works that are more critical of the business world – including Edward Bellamy's Looking Backward, Sinclair Lewis's Babbitt, Frank Norris's The Octopus, and the Wall Street films. In each of his essays, Younkins provides a sequential summary of the fictional work, interspersed with commentary that highlights the philosophical and economic implications of major elements and integrates them with the historical context of the time period in which the work takes place. Younkins is to be commended for emphasizing the value of fiction as a teaching tool for both students of business and individuals immersed in the business world. A thorough reading of the book's Conclusion is highly recommended for attaining an understanding of the unique ability of fiction to communicate memorable lessons rooted in specific, richly detailed situations which render the conflicts, dilemmas, and options faced by individuals in the business world more palpable and engaging than would a sole reliance on lectures, case studies, and outlines of business and economic concepts. In addition, the Conclusion offers a fast-paced chronological overview of many more fictional works which address business themes and which have made their mark on the world of artistic culture. As with his previous volumes, where Dr. Younkins provided integrated presentations of the thoughts of great philosophers and economists throughout the centuries, this book provides a refreshing focus on human flourishing and the application of the lessons of particular novels, plays, and films toward the improvement of both one's own condition and the degree of prosperity found in the broader economy. This is not literary analysis for its own sake, but rather a book that highlights the lessons an individual can take from each great work and apply to his or her own life. Younkins combines his support for free markets, entrepreneurial innovation, individualism, reason, and moral responsibility with an ability to point out the many valuable insights in those works which criticize capitalism as conventionally understood. He utilizes the insights of Austrian economics and his extensive knowledge of economic history to show how the bleak portrayals of businessmen and the business world in these books stem from the consequences of situations where the principles of honest free commerce and individual rights were violated. When critics of capitalism express their objections through fiction, they inevitably portray situations where fraud, corruption, morally questionable manipulation, corporatist special privileges, thoughtless conformity, and zero-sum thinking are involved. All of these are indeed negative attributes from the standpoints of free markets and rational philosophy as well, and Younkins's analysis shows that the works of the critics do make valid points – provided that one understands that the system they are criticizing is the one that has actually prevailed in the Western world over the past century. This is the system which mixes aspects of capitalist free enterprise with significant aspects of corporatist cronyism as well as central planning. It is a system quite different from the free-market capitalism advocated by Henry Hazlitt, Garet Garrett, and Ayn Rand. Indeed, in Atlas Shrugged, the protagonists go on strike precisely against this sort of cronyist system, though one that is farther-gone than our own. In Tucker: The Man and His Dream, an excellent movie to which Younkins devotes a chapter, this is also the system which attempts to suppress a genuine forward-thinking capitalist innovator, Preston Tucker, through the use of political force, motivated by the lobbying of the staid Big Three automobile companies.